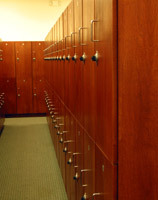 The Student Bar Association (SBA) provides student lockers. Lockers are assigned when the SBA fee is collected during the first week of orientation or during the first week of school for visiting or transfer students. Excepting visitors, graduating students may retain their lockers until after the bar exam. Each student is assigned a mailbox which is located in the hallway across classrooms 2405 and 2406. The mailboxes are grouped by class and alphabetized by last name. In order to reduce paper use, student messages and official Law School notices are distributed through the mailboxes only when email is unsuitable. Paychecks and other sensitive items are held for pickup by the Law Office Receptionist.